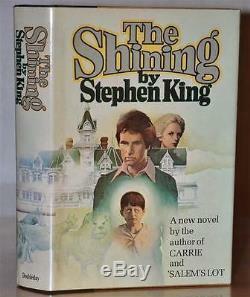 SIGNED STUNNING 1ST/1ST EDITION THE SHINING STEPHEN KING W. THE SHINING, SIGNED 1ST EDITION, 1ST PRINTING. First Edition, First Printing A near fine signed copy with a near fine dust jacket. Signed, inscribed and dated 1982 by Stephen King on the end papers in blue ink. The book will come with a COA from PSA/DNA with the authentication sticker located on the page with the signature, lower corner. The book is in beautiful crisp, clean condition with mustard paper and black quarter cloth boards. The boards have sharp corners, and no edgewear but a touch of rubbing to the spine tip. The binding is tight and square. Bright, unfaded gilt titles to the spine. Stephen King signed and inscribed the book For Brad, Best Stephen King, 7/17/82 in blue ink on the front end paper. Extremely faint faded ghosting from the removal of a bookplate (naturally hidden behind the front inner flap of the jacket). Beautiful condition book internally appearing as crisp and unread. Light remainder spray to the bottom outer page block as commonly found with this title. The book will come with a COA from PSA/DNA. The original unrestored dust jacket presents in near fine condition. The dust jacket has vibrant colors with no nicks, no chips, no edgewear, no rips, no stains and no fading but a very slight tiny touch of rubbing to the spine. A beautiful stunning dust jacket. A very handsome example of this scarce First Edition, First Printing signed title with a beautiful early signature! Would make a wonderful special gift for a Stephen King collector. Show off your items with Auctiva's Listing Templates. The item "SIGNED STUNNING 1ST/1ST EDITION THE SHINING STEPHEN KING W. PSA/COA" is in sale since Sunday, July 10, 2016.